Dread. There is a sense of reckoning due for markets as the FOMC considers its policy and markets pay for the years of easy money and QE unwinding to neutral and beyond. If the Powell Fed distrusts R* and other models then we are navigating with dead reckoning with dot-plots and futures. The permutations for today are many with words mattering as much as actions as there is the dovish hike, the hawkish hold, and the extremes of a dovish hold along with hawkish hike. 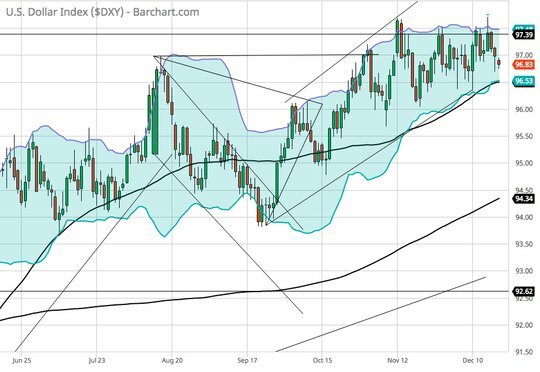 The infamous dot-plots will play a role as well with 2 hikes for 2019 down from 3 now expected – indicating to many that the line of Fed expectations is the cap rather than the floor for rates going forward. The way the Fed explains itself will matter significantly for understanding the market reaction as too dovish a tilt will add to 2020 recession fear and too hawkish will as well. This is the reckoning fear that drives the bear market globally. We are damned if they do or don’t depending on their logic. Quite clearly, the Powell Fed would like to disassociate itself from the Greenspan S&P500 put. But the oil put maybe another story as the reversal of fortune in oil prices matters to inflation rates globally, FX everywhere and to the real economy. The S&P500 put rest on the confidence game, which has been shattered since February for markets and is beginning to turn for corporations since October. This volatility of expectations drives hope for a FOMC response to financial conditions as well. Reckoning which why Powell acts and talks is now all but finished as dread and waiting for the bill dominated overnight price action. There was plenty of economic data from Japan trade deficit increases to New Zealand C/A deficits to weaker Swedish confidence and higher prices than expected in UK and Germany – none of which mattered. Rather the negative Facebook reports on privacy wall end-arounds for Amazon, Microsoft, Apple and others seems to add to risk-off gloom. Or the reality that India is now expected to rise to 5thplace in global GDP pushing out the UK down to 7th. Emerging markets remain key to understanding the present fear with China and India central to 2019 forecasts for Europe and US growth. This puts the USD and Oil as the two markets that maybe the most helpful in watching risk today both before and after 2 pm. Question for the Day: Did Dr. Copper kill Santa Claus? The hope for a Santa Claus rally in US shares to bring them back to flat on the year rests on the FOMC and Chair Powell, but the market barometer of Copper is telling us that the hope is already dead. Copper is on track for the worst year since 2015 when China first imploded. Trade war tensions take much of the blame, but so too does housing. The fear of a US housing reversal has become a reality and it’s the same globally – just read about the worries in Hong Kong or Sydney or ongoing in Canada, UK, Europe. Today’s existing home sales will be watched closely and will be linked back to the FOMC rate decisions in 2018.